Rev. 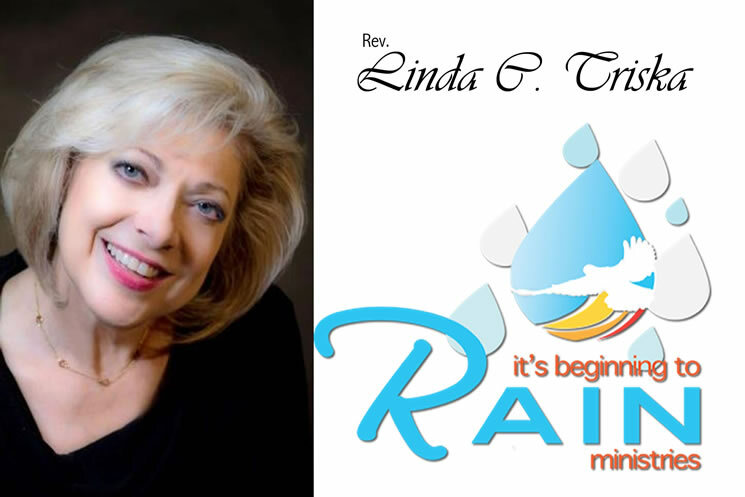 Linda C. Triska, Founder and President of It’s Beginning to Rain Ministries, has been sharing the gospel of Jesus Christ for 30 years. Since answering the call of God in 1984, Linda has been a popular guest speaker in churches, ministry groups, conferences and retreats. She is known for developing and teaching the “Targeting Your Spiritual Gifts” series motivating others to rise up in their gifts and callings. Under the anointing of the Holy Spirit, Linda operates in various 1 Corinthians 12 gifts with many receiving supernatural healings, deliverances and the baptism of the Holy Spirit. Always having a heart to help others, Rev. Triska was also the Founder and Executive Director of Feed My Sheep in the High Desert, a food pantry feeding over 2,000 low-income families per month. Within five years, it became one of the largest pantries in the California High Desert area and was named “Non-Profit of the Year” by the High Desert Resource Network in 2012. Linda continues to provide food and other necessities to the homeless, veterans and senior citizens on a weekly basis through her new non-profit. In both 2010 and 2013, Linda was honored by being named “Inspiring Woman of the Year” by the Daily Press Newspaper and Today’s Woman Foundation. She holds a Bachelor of Science degree in Business Administration with a teaching credential and is an ordained and licensed minister through Anchor Bay Evangelical Association. Linda and her husband, Brad, live in Apple Valley, CA and have a married daughter.